http://www.thefeather.org is the website for the rehabilitation center in New London. Everyone is fascinated with owls. Some think they are wise, some think they are spooky and I think they are beautiful. This year we plan to put up an owl house to attract them, and perhaps they will raise a family in one of our trees. We have plans and have one nearly done, however putting it up will have to wait until the snow melts a little. The houses are supposed to be installed by February 1, but that is impossible this year with trees full of snow and the ice. We will get it up when we can and hopefully at some point have a family of owls move in. The tall trees are still full of snow. I will have to watch the webcam to keep track of the progress of Ms Harvey, a Great Horned Owl. She laid her first egg of 2013 on January 30th. Here is Ms Harvey's story from the website. "Ms Harvey, the great horned owl, came to the Feather Wildlife Rehabilitation center in May 1997 as a bird taken in illegal activity. She was raised by humans and we did not think she would make a release when she was able to fly. But she proved us wrong and flew and killed and was released in fall of 1997. She wears a US Fish and Wildlife band on her right leg, #599-10043. She continued to stay in the area of where she was released and showed up on occasion. We put food out for her so she would stay here to get a good start. That was the start of our “perk” with a great horned female owl. In 2009 she raised two young to about 2 weeks and both of them were predated, possibly by raccoons. In 2010 she had a late hatch and brought off two young. Each year has a story to tell about the nest and the activity. In 2011 she again lost the first clutch and re nested two weeks later and brought off one chick. We gave her two more young owls to raise. One of them is still here food begging. We have been blessed to have this bird in our lives and now wish to share it with all of you on the internet. So many good things are happening all around us if we just pay attention. " This webcam is from New London Wisconsin with live video of the mama Ms Harvey sitting on the egg. We attended a presentation from the people of the rehab center. Here are a few more breeds of owls that they brought along to show. If anyone has the opportunity to see this, it is wonderful. 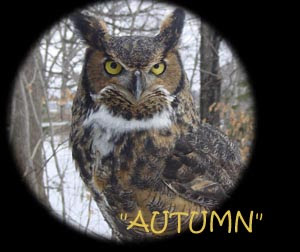 We had this type of Owl in one of our trees this winter. I saw him catch a mouse and eat it so I hope he stays around. I didn't get a good photo. This is the best I could do.